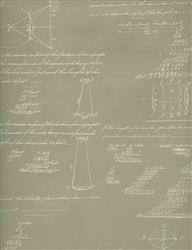 A wallpaper design featuring mathematical equations and diagrams with accompanying scripted text inspired by the work of Pythagoras. Ships within 14 days. Please allow up to 1 additional week transit time for your item to arrive.